We believe youth have the power to shape their own future. Our mission: to create opportunities for youth enrichment in their neighborhood through community engagement, job training, and education. We envision a diverse community of empowered, skilled and capable youth working to strengthen their local environment. Through our paid summertime training program, West Central youth cultivate the skills they need for future employment, build connection with neighbors, and grow a sense of pride and ownership in their community. Youth farmers cultivate thousands of pounds of produce each year and sell it at local farmer's markets. 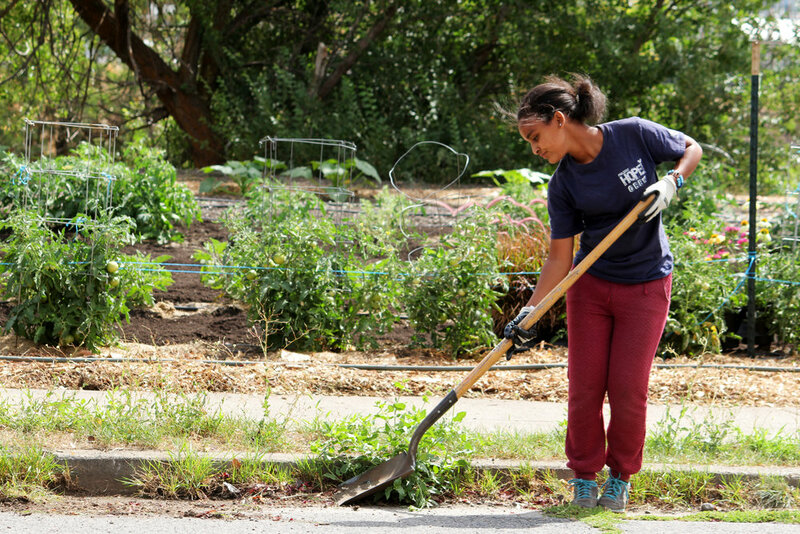 Our urban farm isn't just one place — we have transformed vacant lots throughout West Central into garden plots, increasing access to local produce and beautifying the neighborhood. You can make a difference for the youth in our program! Sign up to volunteer individually — or organize a service day with your coworkers, school group, friends or family. We use donated funds to power our program and pay youth for the work they do. You can enable us to accept more youth into our training program next summer by donating today! In the off-season, we're working hard to build our curriculum, improve our lots and raise funding to pay youth trainees next season. Another Summer has come to a close, and what a great Summer it has been! From farmers' markets to garden parties, we've had a great time connecting with the community and mentoring the youth of West Central. We've achieved a lot of great things together during the harvest months. Now the days are shorter and the weather's colder, but we have some great things to achieve yet! Summer Season in Full Swing! River City Youth Ops has reached some major milestones this year. For the first time ever, we have had a full time Farm Manager — the amazing Maddy Halverson — on staff. Among many of her duties, Maddy has been charged with developing a comprehensive curriculum that not only teaches job skills, but also works to recognize the needs of the whole person. Join us for craft cocktails, fresh food and an auction to support River City Youth Ops! Our annual fundraiser supports our mission to create opportunities for youth enrichment in their neighborhood through community engagement, job training and education. We have a lot to be excited about as we embark on the 2018 growing season. We have been working diligently to develop a dynamic and vibrant curriculum that focuses not only on the basics of job training and farm ecology, but on leadership and food justice as well. As the seasons change, we at River City Youth Ops are preparing for a new year of empowering youth to become leaders in their community. You can help kick-start our season by sponsoring a youth participant and signing up for our veggie subscription. River City Youth Ops’ urban farm is offering our 20-week veggie subscription (also known as Community Supported Agriculture or CSA) full of healthy, fresh, and super locally grown produce. All produce is grown in the West Central Neighborhood by neighborhood kids that we hire and engage in personal and professional development through community engagement, job training, and education. The first Saturday in April found a few Youth Participants hard at work building beehives with the West Plains Beekeepers Association. In this case ‘dress for success’ means protective gear – jackets, veils, and elbow-length gloves. They’re not the easiest items to take on and off but they were still a hit. Be the first to hear about community gatherings, opportunities to serve alongside youth and other ways to make a positive impact on your community with River City Youth Ops.